Lately, Evan and I have been making small strides in improving our home’s aesthetic. We’ve owned our house for close to four years now and we’re finally ready to invest a little and start creating a space that we’re really proud of and that reflects us. We’ve been making small but significant purchases like this rug that currently lives under my desk and these Eames replicas that are now our dining chairs. We also recently added all new lighting and drywall to our studio which has made such a positive difference in our work space. Last year, we painted our bedroom bright white (from a dark chocolate brown) and got all white linens and white curtains…I can’t tell you how much we love it. Well, maybe I can… we love it so much, that we’ve decided to paint the ENTIRE house white. I just love the clean, calm, minimalist feel of an all white room. And since, most of our furniture is some form of natural wood (or wood veneer for the few rogue Ikea pieces we still keep around), I’m really loving the images above as inspiration for our home’s future look and feel. The best part of a neutral palette, is that I can change it very easily with a pop of color or pattern when ever I want. Some people find white boring, what do you think? Are you a fan of neutral palettes? Or is color more your thing? Also, has anyone out there painted their wood floors white or any other color? I’d love to know! Evan’s not too keen on the idea but I think it sounds like fun. xoxo! I wish my house was so neat and white. Lovely. I want to live in an open environment like this, simplified, clean and open. Let’s make it happen Mr.! lurve. White – bright, clean, vibey … you can’t beat it, but there might be a few buts. If you live where it’s cold, you’ll need to add warmth in the form textures and/or colour in the winter or you will feel cold. Truly. If you have animals who jump in or out of windows, or track dirty paws in from the garden, be sure you use the latest/best wash’n wear brands. There’s nothing worse than dirty, in white. From the point of view of resale value, your partner might be right about the white floors. Most people are more conservative than you. What an exciting time you’re embarked on – fabulous. Good luck. I am loving the white theme, so fresh and inviting! Those photos are fabulous inspiration, I wish my place looked like this! Sigh* I am hopeless when it comes to commenting! However I am loving the white theme, so fresh and inviting! Those photos are fabulous inspiration, I wish my place looked like this! I think it looks lovely, your wood tones warm it up leaving it feeling cozy rather than stark. Very nice! These imaages a gorgeous. 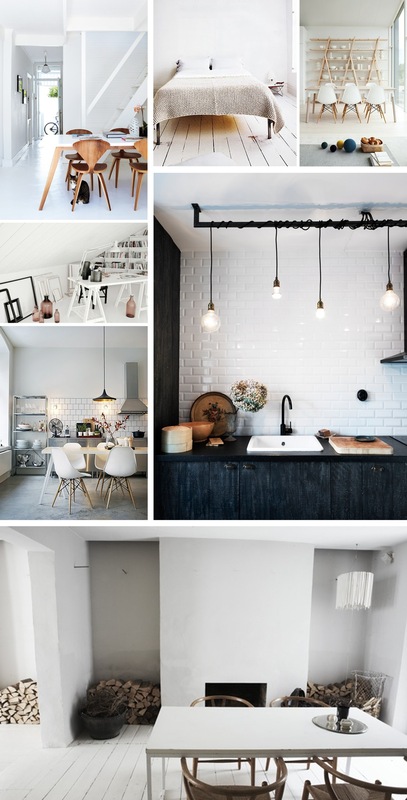 I adore neutral and white palettes I think there is something so fresh and clean about the spaces which use these colours. I always feel its easier to add some colour through soft furnishings or accessories if a pop of colour is needed. I love white with little pops of color. Little accents here and there can really transform the look and feel of your place. For examples, a neutral bedroom with 2 big tangerine pillows on the bed. The best thing about that is you can change it up without too much work! Pillows, light shades, curtains, candles, even small items like the photos on your walls can bring a bit of color into the room. Those are my 2 cents! I remember seeing an episode of Trading Spaces that they painted the entire walls, floor, and everything white. It looked really bad. I think its because they didn’t vary the colors of white like these pictures do… I think that’s the key element. I know, whatever happened to that show? I wish it was still on! Do you remember “While You Were Out”? That’s my favorite of those decorating game shows. White floors are kind of scary. Their solution in that episode was to install a heavy duty floor covering, staple it to the floor and paint that white. They didn’t like it… so I could see your husband’s trepidation. Gorgeous. Love a white space! my guy and i just bought wishbone chair replicas, i agree they’re the way to go!! ah super cute!! do i dare try and paint ours…??? LOVE YOU GUYS and can’t wait to see you next week!!! Miss Diamond loves white!…but I don’t think white loves Miss Diamond. We’re so looking forward to seeing you too….and just taking a break in general (especially Evan! ).